This post will cover using EM12cR2 to create a Data Guard configuration including one primary database and one physical standby server, making use of the Data Guard broker. The application software we use does not support logical standby databases so I have not attempted to do so and will not document that here. As this post focuses specifically on creating a new Data Guard configuration, I will assume you have an existing functional EM12c environment in place along with two servers to use for Data Guard and an existing database which you wish to protect running on one of those servers. 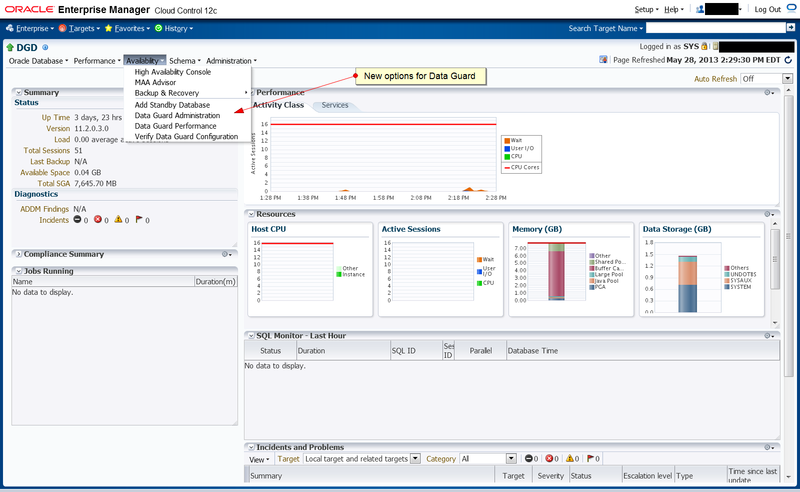 Both servers should exist as promoted targets within EM12c. The existing database (along with its listener and ORACLE_HOME) should exist as promoted targets within EM12c. The standby server should have a software-only installation of the same version and patch level of the Oracle Database (Enterprise Edition only) as exists on the primary server. For simplicity I suggest using the same filesystem paths on both servers, although Data Guard does allow rewrite rules if necessary. Note that Data Guard is a feature included with an Enterprise Edition license but running a physical standby will require a license for the database software on the standby server. Contact your sales representative for full details. For the purposes of this post I will assume you are using a copy of the database downloaded from OTN for prototyping purposes. Configure the database as you wish. One point I recommend is to make sure that your redo logs are appropriately sized and that you have enough of them, as adding or resizing redo logs after Data Guard is operational requires some special care. Now that your environment is set up with a working EM12c installation and one active database that you wish to protect with a Data Guard physical standby, you can proceed. Start by going to the database home page and select ‘Add Standby Database’ from the drop-down menu under ‘Availability’. On the next page, select ‘Create a new physical standby database’ and click continue. On the next page you select a method to instantiate the physical standby database. Select ‘Online Backup’ and ‘Use Recovery Manager (RMAN) to copy database files’, then click Next. On the next page you specify the degree of parallelism for the RMAN backup, provide operating system credentials for the user owning the Oracle installation on the primary server (oradgd, in my case) and define the locations of the standby redo logs. The degree of parallelism is up to you and depends on how many CPUs you have and how quickly you need the backup to run. I specify new named credentials here and save them as preferred database host credentials. I recommend clicking the ‘Test’ button to validate the supplied credentials. I do not use Oracle-Managed Files so I have unchecked the box to use them for standby redo log files, which allows me to specify a location for the standby redo logs if I do not like the default. I left these locations at their default. After making your entries on this page, click Next. 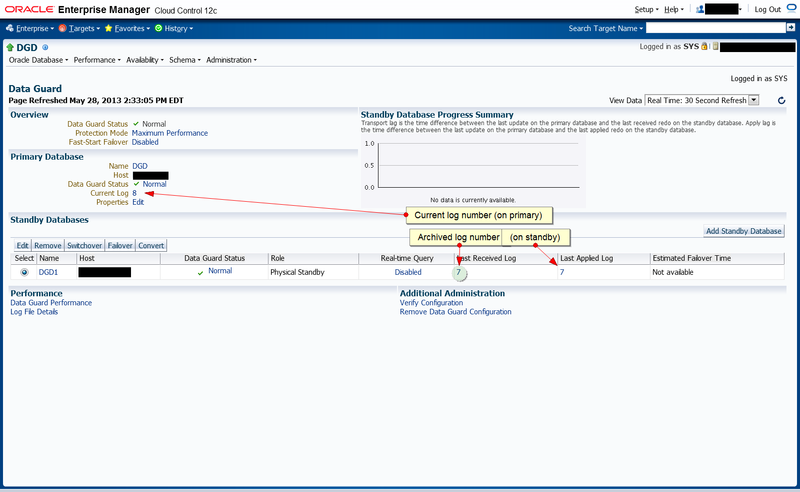 On the next page you will specify configuration details for the standby database. All entries on this page relate to the STANDBY server, not the primary. Enter the hostname of the standby server and the path to the Oracle home installation you will use for the standby database. Enter credentials for the Oracle home’s software owner, and again I recommend saving them as preferred credentials and clicking the Test button. The instance name you provide must not already exist on the standby server. I used the same instance name on the standby as on the primary. Click Next after entering all required information. The next page allows you to select the file locations for the standby database and define the listener parameters. I want to keep things simple with my standby using the same file paths as the primary so I select the radio button labeled “Keep file names and locations the same as the primary database“. If you wish, you can click the ‘Customize’ button and specify alternate file locations for data files, control files, temp files, directories and external files, but keeping everything identical between the two servers will simplify things greatly. I will also use the default listener name and port. Click Next once you have made your selections here. 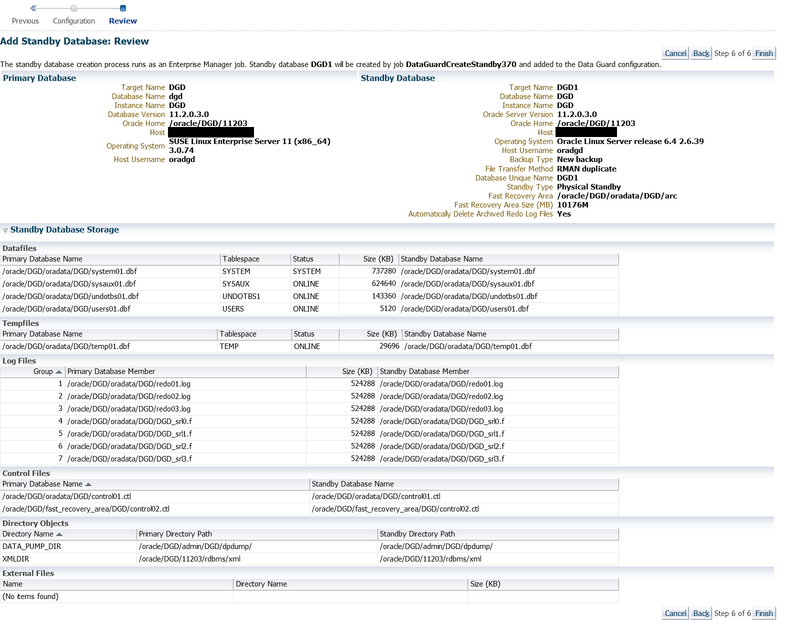 On this page you specify some final parameters for the standby database such as the DB_UNIQUE_NAME, the name EM12c will use for the standby database target, the location for archived redo log files received from the primary, the size of your FRA and the deletion policy for archived redo log files. For the best monitoring experience, check the ‘Use SYSDBA monitoring credentials’ box. I also suggest you leave the option checked to use the Data Guard Broker. Click Next once you have made your selections here. The final page you see here will show a review of the settings you have selected through the process. You can see here that I am setting up a standby on Oracle Enterprise Linux while my primary runs on SUSE; this is not a problem for Data Guard. Double check everything to make sure it is all correct, and once you are satisfied, click the Finish button. As soon as you click Finish on the previous screen, EM12c will start setting up your standby database. You should quickly see a screen like the one below showing that a job has been submitted to create the Data Guard configuration. If you click on the ‘View Job’ text, you will see the execution log from the job run. To monitor the job as it proceeds, you can click on the ‘Expand All’ text and then set an auto-refresh interval from the drop-down at the top right. Depending on the size of your database and your server performance, and assuming everything went well, you should soon see that the job has completed successfully. The Data Guard administration page shows a summary of your setup. You can see the host running the primary database, the status of your standby(s) and various metrics like the current and last-applied archived log numbers. The various links on this page can then be used to change the protection mode, enable/disable fast start failover and so on. You can also use the ‘Failover’ and ‘Switchover’ buttons to initiate a role transition. Read the documentation so that you understand the difference and know which to use in which situations. To help convince yourself that all is working properly, set the auto-refresh interval to 30 seconds and leave this page up. Open a sqlplus session on your primary database as sysdba and run “alter system switch logfile”. You should see the log numbers increment once the refresh interval has passed, as shown below. As a final test, attempt a switchover operation. This will leave your current primary database running as a standby, while your current standby database takes over the primary role. Click on the ‘Switchover’ button. Here you are prompted for credentials on the standby database, which is why I suggested saving them as preferred credentials during the setup process. If you did not do so then, provide appropriate credentials now, then click Continue. Next you’ll be prompted for credentials for the primary server. Provide those credentials, if necessary, and then click Continue. Next you will have one final screen to click through to start the switchover process. There is a checkbox to choose whether or not you want to swap monitoring settings between the primary and standby databases. I check the box as this is a good thing, but as the text says you have the option to NOT swap the monitoring settings and instead use your own detailed monitoring templates for each system and apply them after the switchover. I prefer to keep it simple. Once you are ready to go, click Yes, but be aware this will disconnect any sessions active in your primary database. You will see a progress screen as the switchover occurs. Once the switchover completes EM12c will return you to the Data Guard Administration page, where you should see that your primary and standby servers have switched roles. If you have been following along, you now have a functional Data Guard system with a physical standby and have successfully completed one switchover operation. You can repeat this process to add another physical standby database on a third server if you wish. As you look around you’ll also notice a few other changes, such as the additional targets that EM12c added for the standby database, or that the Databases list view has some extra text added that indicates which instance is running as primary and which is running as a standby. Now it’s time to research your needs for Data Guard and get all the remaining bits configured to best support your users. Good luck! This entry was posted in Cloud Control, Database and tagged Data Guard on May 28, 2013 by Brian Pardy. 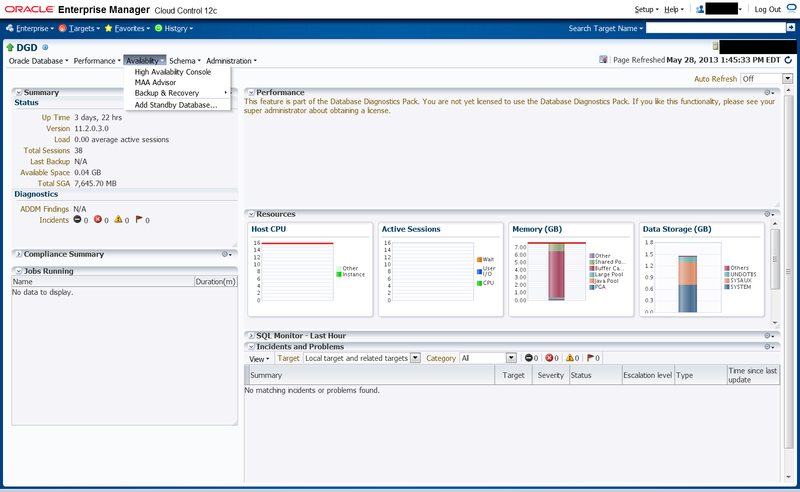 This post reviews the Oracle Enterprise Manager Plugin for VMware from BlueMedora. This commercial (for-fee) plugin integrates into OEM 12c to provide visibility into your VMware environment for Cloud Control users. I have only had the plugin installed for two days so this will serve as more of a “first thoughts” report than as a full review of the product and all of its capabilities. A functional emcli installation. I run emcli out of the $OMS_HOME on my OMS server. At install time you will also need the hostname of your vCenter server and the SDK port if it has been changed from the default 443. After downloading the plugin from BlueMedora, installation is as simple as any other plugin you may already be using. Their support team will walk you through the install and configuration (over a webinar in my case), but the steps are just what you would expect: copy the plugin .opar file to a location accessible by your OMS and import it using the emcli import_plugin verb, then after the import completes, deploy the plugin to your OMS and finally deploy the plugin to a management agent. Configuring the plugin (adding targets) is also simple. For the first step you will run an “Add Target Manually” step with the “VMware vSphere” target type to let the plugin know about your vSphere environment. Here is where you will provide your VMware login credentials, hostname and port (if non-default) in order to begin monitoring. 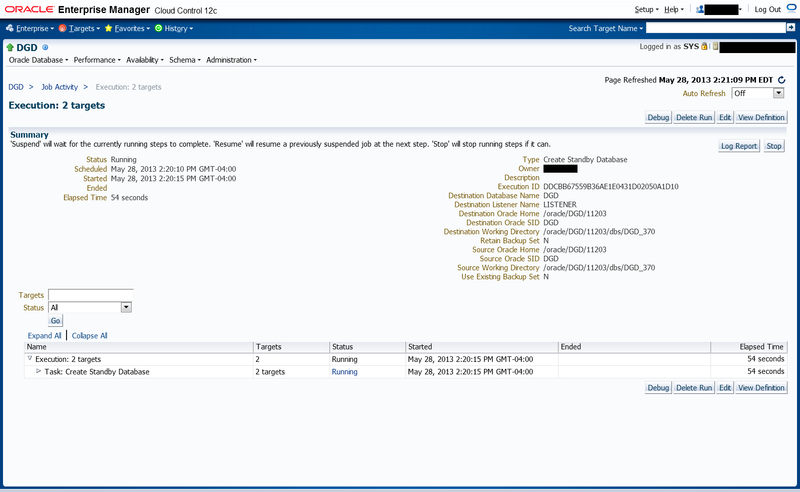 After adding the vSphere target, access it through the All Targets view, and go to the “All Metrics” link to validate that your VMware login credentials worked and metrics are being collected. As an aside, a particularly interesting feature here that I have not seen in other plugins is that there is a metric group called “Collection Trigger” that, when clicked, triggers a collection. This is handy and I would like to see this implemented elsewhere; I find it much easier than going over to an agent and running emctl to force a metric collection. 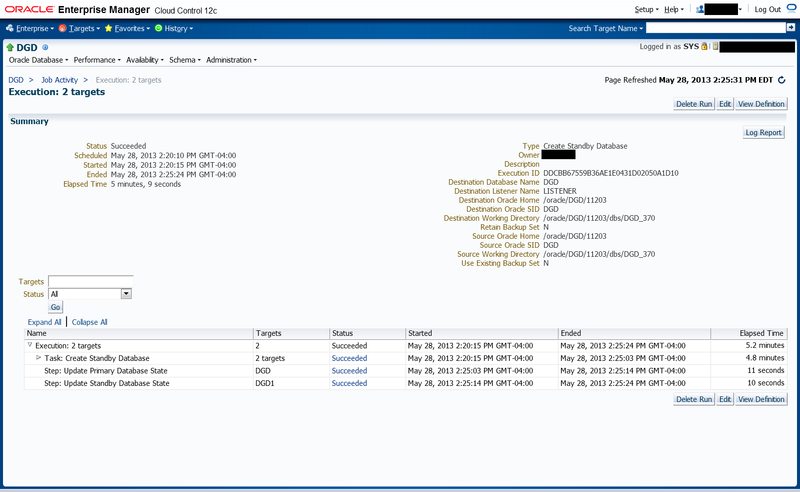 Once that is done you will see a new auto-discovery module called “vSphere Discovery Module”, and after configuring that discovery module with the name of your vSphere target you will run auto-discovery on the management agent to which you have deployed the plugin. Auto-discovery identified our VMware cluster, ESX hosts (hypervisors), datastores and all of our virtual machines. From the auto-discovery results you then promote any targets you wish to monitor through Enterprise Manager. You may not want to promote all of your VMs (for management reasons, or to comply with your license terms) but you should promote all clusters, hypervisors and datastores, for the best overall view of your environment. As with the other plugins I’ve used, after promoting targets you’ll need to wait a little while before metrics are collected and screens populate with data. In my case I had useful data appearing on screen within about 10 minutes after promoting the first VM. For a good high-level overview of what the plugin can do, take a look at the white paper from BlueMedora, the product overview PDF and the product datasheet. I’ll only cover some of the additional items that these sources do not go into in detail. The plugin provides several nice visualizations. On top of the “CPU and memory usage over time” graphs you would expect to find, I particularly like the bar graphs that group your hypervisor CPU and memory load into quantiles, making it easy to see, for example, that one host has 75-100% CPU usage while the other hosts are all in the 0-25% bucket, indicating that you may want to allocate your VM load a bit more evenly. The datastore visualization showing the fill percentage on each datastore is also nice. Samples of these can be found in the product overview PDF. Another useful visual is the integrated view of an Oracle database along with the VM on which it runs, the datastore(s) assigned to that VM, and the hypervisor on which the VM is running. You can quickly see if, for example, the hypervisor is under memory pressure even if the VM does not appear to be, along with the executions and IOPS per second and average active sessions metric for the database. I find it hard to click through the vSphere client to find information I’m looking for. I’m always in the wrong inventory view, or seeing only a subset of the data since I have a host selected rather than the entire cluster, and so on. This plugin provides an easy to use centralized view of information across the VMware environment. By going to the “Virtual Machines” view from the main vSphere target I can see a data grid showing each VM’s power status, provisioned disk, consumed CPU and memory, guest memory usage percentage, Even better, the grid includes a column indicating whether or not VMware tools are installed and running. There’s also an uptime column but I’m not sure how to parse it. I think it represents the VM’s uptime on the specific hypervisor currently running it, but I’ll be asking support to clarify that for me. What use is an OEM plugin without metrics and alerting? Very little. This plugin provides a ton of metrics for your VMware environment. The list is too long to include here, but see this on pastebin for a quick view produced from the MGMT_METRICS table. You can also set warning and critical thresholds for many (although not all) metrics, and those alerts will go through the normal EM12c event framework to create incidents and/or notifications if configured to do so through incident rules. You can also view the same metric-over-time graphs as you can with the out-of-the-box EM metrics. The overview states that the plugin includes some integration with BI Publisher for reports. I do not have BI Publisher installed with my EM12c environment so I can’t speak to this feature. I am not employed by BlueMedora, VMware or Oracle and neither I nor my employer received any consideration or compensation from those vendors. This entry was posted in Cloud Control and tagged plugin, vmware on May 10, 2013 by Brian Pardy.